Most people see the world on a single plane, known as the temporal (Waking World). But really, there is much more to life than the temporal. No one knows this better than Archer Keaton, one of three human beings specially selected to be guardians of another realm: the Dream. Archer’s job is relatively simple. He must protect the two worlds by keeping them from colliding. But now, a rift has been formed between the Dream and the Waking World, and chaos has erupted. Archer’s epic dreamtreading saga comes to a head in this conclusion to the fantasy trilogy: War for the Waking World. 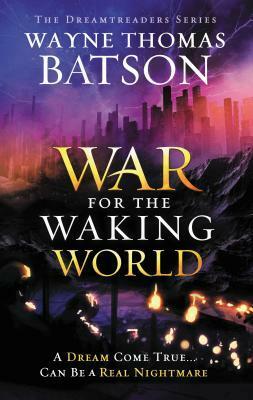 Batson has definitely shown a lot of improvement as a writer throughout this trilogy, so I can confidently say that this third book is the best of all. The plot is full of twists and turns that will keep readers on their toes. You’ll find yourself jumping between worlds and exercising brainpower right alongside Archer and his friends as they fight to keep the world from imploding. In my review of the original Dreamtreaders, I mentioned that this story wasn’t written for people like me (a twenty-something female). However, I was surprised to find myself really enjoying the series, in spite of myself. As a writer, I appreciated the book for its creativity and well-developed plot. As a reader, I appreciated the book because it drew me in. As a teacher, I appreciated the book for the lessons it has to offer kids about courage, forgiveness, and sacrifice.